Scotty is a Star, Access Hollywood Says It's So! Scotty McCreery will present at the CMT Music Awards! The official press release was made an LOOKIE IT'S SCOTTY AND LAUREN!! I will add this to the side bar for appearance dates! If there are other dates that you don't see on the side tweet me @fansofscotty to let me know and I will add those too!! 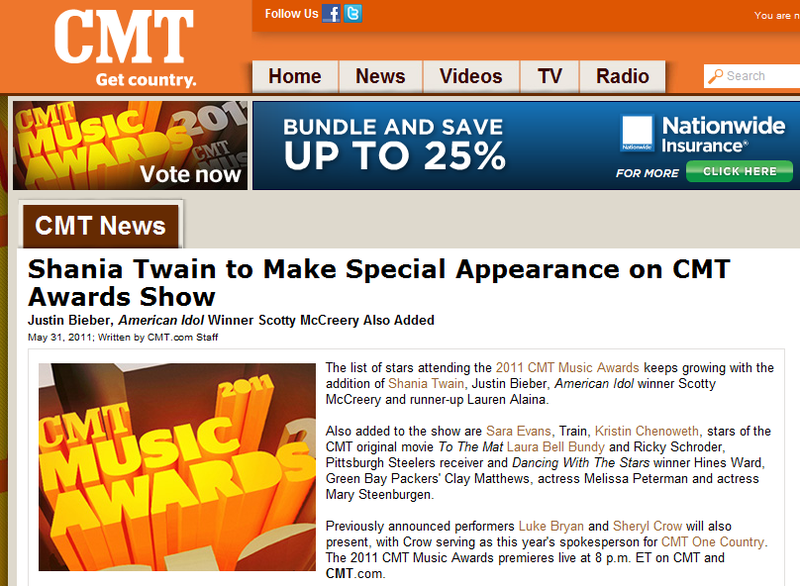 PRESENTERS ANNOUNCED FOR THE "2011 CMT MUSIC AWARDS"
NASHVILLE - May 31, 2011 - The list of stars attending the 2011 CMT MUSIC AWARDS keeps growing with the addition of Shania Twain, Justin Bieber, 'American Idol' winner Scotty McCreery and runner-up Lauren Alaina, Pittsburgh Steelers receiver and 'Dancing With The Stars' winner Hines Ward, Sara Evans, Train, Kristin Chenoweth, stars of the CMT original movie 'To The Mat' Laura Bell Bundy and Ricky Schroder, Green Bay Packers' Clay Matthews, actress Melissa Peterman and actress Mary Steenburgen. Previously announced performers Luke Bryan and Sheryl Crow will also present, with Crow serving as this year's spokesperson for CMT ONE COUNTY. 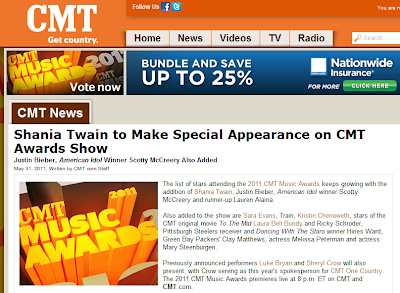 The 2011 CMT MUSIC AWARDS premieres LIVE on Wednesday, June 8 at 8:00 p.m. ET/7:00 p.m. CT on CMT and CMT.com. I have updated the Fan Contest Page, and you can access the information by clicking the tab at the top of the site. Good Luck!! The lineup for the City of Hope Celebrity Softball Challenge just got bigger and better! 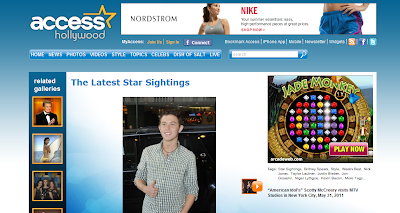 ‘American Idol’ winner Scotty McCreery and ‘Idol’ runner-up Lauren Alaina have been to the already star-studded lineup that includes Brett Eldredge,Chuck Wicks,David Nail,Dierks Bentley,Jake Owen,James Wesley,Jaron and the Long Road to Love,Joe Nichols,Kerry Collins (of theTennesseeTitans) ,LoCash Cowboys,Point of Grace,Robin Meade, andVince Gill. This year’s game will take place at 9am on Saturday, June 11 at Greer Stadium in Nashville, TN. Click HERE to purchase tickets. Thanks MJ! for the uplaods! !